Walkers in Angus are spoilt for choice with some of the finest glens in the country and the lovely Glen Doll, north of Kirriemuir, provides the gateway to a number of Munros. Driesh and Mayar are the two obvious ones but those who don't mind a long walk in can opt for Broad Cairn and its near neighbour Cairn Bannoch. Cairn Bannoch is the higher at 1012 metres but the 998 metre Broad Cairn offers much more character with its rocky summit and steep sided coire leading down to the Dubh Loch. The walk starts at the excellent car park and picnic site at The Doll. Cross back over the bridge leading to the car park and head north along the track through the woods, ignoring the branch for the Capel Mounth, and through a gate to reach the smallholding at Moulzie. The path skirts around the cottages and continues straight on to reach another small plantation. When we visited in March we were greeted by a frog chorus with dozens of amphibians crawling about in the soggy grass near the Burn of Gowal. The remains of a crashed Fairey Alabacore plane, which met its fate in 1941, lie in the woods on the other side of the burn. Follow the track to eventually cross the water at a bridge (GR: 278789). High up to the left is the craggy outcrop known as The Strone and further on and on your right is the distinctly un-Scottish sounding Juanjorge. The path continues to climb gently as you make your way through the valley towards Bachnagairn. A couple of electrified deer fences are crossed here with the help of large stiles and on your right the tumbling waters cascade down through deep gorges in dramatic fashion. Pass through the small wood and cross the burn via a finely constructed wooden bridge and continue on the track which begins to climb earnestly up the hill. The path winds upwards through the heather and eventually flattens out near a wooden stable (GR: 256809) which provides handy shelter in bad conditions. The path for Broad Cairn heads off in a westerly direction and is a fairly gentle climb. It is worth stopping half way up to look across into Glen Muick with its large loch nestling far below. On a clear day the imposing summit of Lochnagar will dominate the view north and Mount Keen will also be visible in the distance. 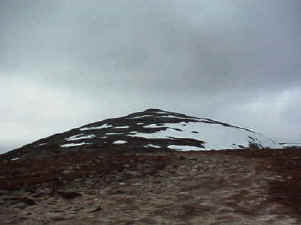 The summit of Broad Cairn is a nicely rounded cone and a modicum of care should be taken on the boulder strewn upper reaches which can easily trap a wayward foot. Across to the north and above the Dubh Loch is Eagles Rock, another favourite spot with climbers. Drop down from the summit and pick your way through the rocks to reach an obvious track leading north west to Cairn Bannoch. This second Munro is reached in half an hour's easy walking and offers a fine view of another neighbouring 3000 footer, Carn an t-Sagairt Mor. 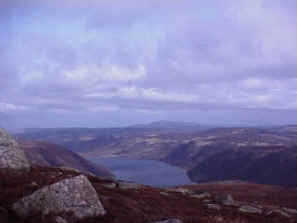 From Cairn Bannoch the walker is presented with a number of routes home. If time permits it is easy to add a third Munro to your card by heading across the Knaps of Fafernie and crossing Jock's Road to reach Tolmount. You can also retrace your steps to Broad Cairn and the little wooden shelter and then head back along the path on top of Sandy Hillock and descend back to The Doll by the Capel Mounth. I opted for a high level traverse along the other side of the valley above West Corrie to Cairn Broadlands by walking to the summit of Cairn of Gowal and then making my way to little Loch Esk. From Loch Esk walk south east past the rocky outcrop at Den of Altduthrie and climb the rising slopes of Cairn Damff and you are presented with a glorious lofty promenade which provides spectacular views all around. Keep heading east and you will eventually come to the summit of Cairn Broadlands which towers over the car park. The path down from the 852 metre top is easily picked out and is quite steep in places so care should be taken on tired legs. The way enters the woods and continues to zig-zag its way through the plantation to exit at a gate near the farm at Acharn next to where you left your transport. Start/parking Car park/picnic site at The Doll. GR: 285762. £1 parking charge. Grading A long walk in to two Munros suitable for fit adults. No easy escape route if the weather turns nasty so proper clothing must be taken. For added safety route cards can be deposited in the little hut at the car park which also provides a summary of the local weather forecast with wind speeds and temperatures on the mountain tops.